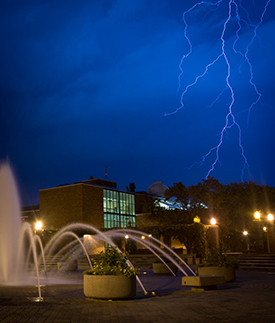 Get involved in Earth & Environmental Systems faculty research projects. Many opportunities exist for undergraduate and graduate students to pursue research under the guidance of faculty mentors in Geosciences, Anthropology, Geography, and GIS/Remote Sensing. Some of the projects that you can participate in are listed below along with contact information. Build your resume by getting involved today! 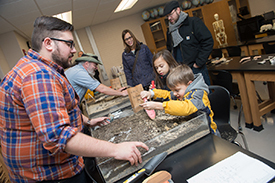 Laboratory Assistant positions are available in the Archaeology Laboratory for undergraduate anthropology majors to work with archaeological collections and samples from more than a thousand sites in southern Indiana housed at ISU. Contact Dr. Russell Stafford for further information about current projects and available positions. Graduate student research opportunities in Geoarcheology are available in the Earth & Quaternary Sciences MS program. Research is focused on landscape evolution and soil-geomorphic modeling in the lower Ohio River valley region. For more information contact Dr. Russell Stafford. Research opportunities are available for undergraduate and graduate students interested in studying the biogeochemistry and sediment geochemistry of marine and terrestrial environments on timescales ranging from hundreds of millions of years to modern day environmental problems. 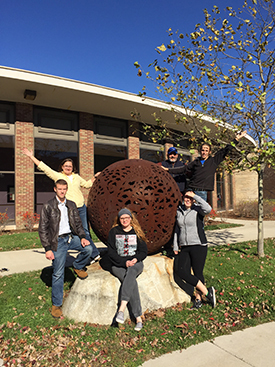 Current student projects include environmental geochemistry of heavy metals in urban soils, lacustrine sediments, and fluvial sediments and paleoceanographic studies of the Southern Ocean, Bering Sea, and the phosphorus geochemistry of ocean anoxic events. Students working on research projects get hands-on experience collecting, processing, and analyzing their samples using state of the art equipment and instrumentation. For more information contact Dr. Jennifer Latimer. Research opportunities for undergraduate and graduate students are available in dendrochronology involving the use of tree rings to reconstruct environmental variables such as fire, insect outbreaks, and climate. Students work on a variety of research projects throughout the United States. There is currently funding for research in Indiana at the Big Oaks National Wildlife Refuge to examine the effect of fires on tree growth in the Eastern Deciduous Forest. This is the first time that a complete fire history has been conducted in this many hard wood tree species in the eastern US. Another long-term and on-going project is at the Bridger Antelope Trap in Wyoming to determine when the trap was built through examination of cutting dates for wood incorporated in the trap. Funding is being pursued with the National Science Foundation to examine pandora moth outbreaks throughout the entire range of ponderosa pine trees in the western US. This research will be a model for reconstructing insect outbreaks across the entire range of the organism and using the dendrochronological record of outbreak dynamics to define the operative spatial scales for these insects. With all of this work undergraduate and graduate students have the opportunity to define their research and develop their own projects in many locations around the United States. For more information contact Dr. James Speer. Exciting research and experiential learning opportunities are available for undergraduates and graduate students in marine sciences (paleoceanography). Research projects focus on the ecology, geology, and geochemistry of seafloor environments for applications in paleoceanography, paleoclimatology, and biological and biogeochemical responses to pollutants, seasonality, and environmental change. Current projects include National Science Foundation-funded research to investigate new carbonate ecosystems in seafloor methane seep habitats off the coasts of Costa Rica and Oregon; methane seep ecology and isotope chemistry of methane seeps off California; and seafloor seasonality of the Antarctic. The methane seep research projects use a remotely operated vehicle (such as Jason) or a manned submersible (Alvin; most famous for its role in the discovery of the Titanic and hydrothermal vents) to sample the seafloor at about 1000 m depth. We currently have 3 funded cruises that use Alvin to study the seafloor in 2010-2011. 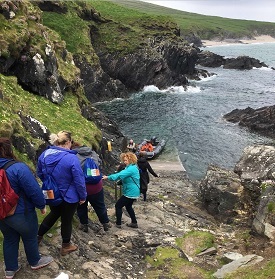 Students actively participate in cruises, conduct independent research and present their findings at national and regional meetings. For more information contact Dr. Tony Rathburn. 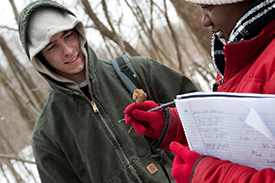 A broad array of research and experiential learning opportunities are available for undergraduates and graduate students in environmental sciences. 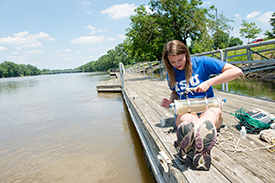 Several faculty at ISU are actively engaged in a wide variety of environmentally oriented research projects. Most of these projects involve both field and laboratory-oriented research activities. These projects include: investigation of microbial communities and geochemistry of acid mine drainage environments; ecological and biogeochemical responses to pollutants; phosphorus and carbon geochemistry of modern and ancient, marine and fresh water, environments; nutrient input history of the ocean through time; ecological and biogeochemical responses of marine organisms to environmental change; and reconstruction of fire history, insect outbreaks, and climate change through time. 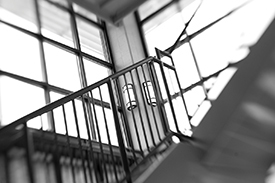 For more information on individual faculty research projects, visit the faculty member web page. Research and experiential learning opportunities are available for undergraduates and graduate students in paleoclimatology and Paleoceanography. Several geosciences faculty study ancient oceans and/or climate change through time using a diverse assortment of techniques. Projects include: geochemical analysis to determine changes in nutrient cycling in the Atlantic and South Pacific Oceans and the Bering Sea; development of microfossil proxies to assess methane flux history; and use of tree-rings to reconstruct climate change through time. Each of these projects actively involve students in field and/or laboratory research activities. Varies UG NSF sponsors summer internships in the Earth Sciences at various universities and institutions in the U.S. The internship usually includes room, board, and a monetary stipend. GeoCorps America Early February Both GeoCorps America is a Geological Society of America program in partnership with government agencies. It offers paid short-term geoscience positions. Project topics include geology, hydrology, paleontology, mapping and GIS, minerals, soils, glaciology, geo-hazards, karst, education, and interpretation. December-January Both This program is a partnership between the National Park Service and the Geological Society of America. It offers short-term, paid internships. Project topics include research, synthesis of scientific literature, geologic mapping, GIS analysis, site evaluations, resource inventorying and monitoring, impact mitigation, developing brochures and media presentations, and educating park visitors. Positions can last from 3 months to one-year. NASA Varies Both NASA sponsors internships at various NASA facilities and universities. Visit their site for more details. The DOI offers a number of internship opportunities through its various agencies that include the Bureau of Land Management, Bureau of Ocean Energy Management, Bureau of Reclamation, Bureau of Safety and Environmental Enforcement, the National Park Service, Office of Surface Mining Reclamation and Enforcement, U.S. Fish and Wildlife Service and the U.S. Geological Survey. Click on the link for more details. Both The program provides summer interns the opportunity to work with state agency officials. Interns will spend at least 50 percent of their time on a predetermined project that enhances college-level skills and abilities. Recipients are paid a rate of $11.30 per hour. Must have completed one year of college to apply.